Figure 17 Energy grid map of a(1-3) linkage in trisaccharide 2. 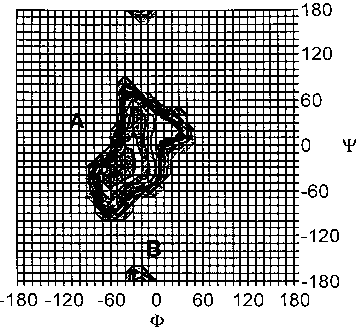 Isoenergy contours are scaled at 1 kcal/mol intervals up to 6 kcal/mol above the global minimum energy. followed by mediated immune response against bacterial cells was established by Bertozzi et al. [141,142]. Numerous bacterial strains produce surface lectins, which are in the form of fimbriae (or pili), which are filamentous appendages of protein subunits. 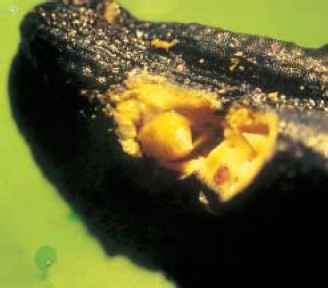 They are found to be responsible for cell-cell recognition and infectious diseases. 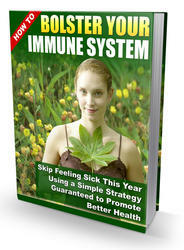 However, many bacteria undergo genetic changes to eschew the host immune system. In spite of these changes, the binding specificity of bacterial cell surface lectins is conserved . Lectins are a group of nonenzymatic proteins with high affinities for mono- and oligosaccharides. They have been found in animals, plants, microorganisms, and viruses; in many cases, their sugar specificity has been determined . Among the best-characterized fimbrial lectins are the type 1 fim-brial lectins, which are specific for a-mannosides [145,146]. The binding affinity of the mannose receptor to a mannose ligand falls in the millimolar range. Only recently has the literature suggested that the avidity of carbohydrate ligands binding to proteins can be increased dramatically when carbohydrate ligands are organized as mul-tivalent clusters [88,147,148]. The mannose-containing glycopolymers and glyco-dendrimers have been shown to have ideal inhibitory effects of binding on yeast mannan to concanavalin A and pea lectins . The results of the experiment conclusively illustrated that the well-defined glycodendrimers were not as effective as the glycopolymers. In an attempt to capitalize on these preliminary studies, new types of a-gal epitope and mannose-containing glycopolymer were synthesized for use in detailed studies on inhibitory affects toward anti-Gal antibody (Fig. 18). 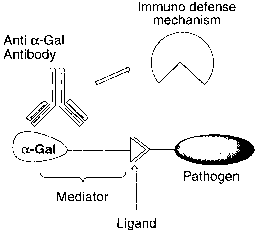 Figure 18 Schematic representation of human immune defense against pathogen through a synthetic a-gal-ligand mediator. mercially available 2-[2-(2-chloroethoxy)-ethoxy]ethanol 38 (Fig. 19) was chosen as a spacer building block to provide for the convergent polymer distal flexibility that would facilitate transfer efficiency in a proposed final enzymatic transfer modification of the glycoconjugate. Complete transformation of the chloride 38 to the corresponding azide 39 was accomplished via an SN2 type addition in DMF at 80°C according to a well-known procedure . A Koenigs-Knorr glycosylation method employing a-lactosyl bromide heptaacetate 29 with azide 39 gave compound 40 in an 82% isolated yield. As a result of neighboring group participation, from the 2-acetate protecting group, the desired /3 configuration was established and confirmed by the coupling constant of the anomeric proton (J12 = 7.8 Hz). The corresponding intermediate product 42 was accomplished by a simple quantitative yielding Zemplen method to give 41, followed by azide reduction via hydrogenation and treatment with acryloyl chloride to give 42 in 71% yield. a-Mannosyl acrylamide 45 (Fig. 20) was synthesized according to a similar approach to that described for 42. The glycosylation reaction provided compound 43 in moderate yield (49%). The desired a configuration was determined by the anomeric coupling constant (J12 =1.5 Hz) along with a characteristic feature that there were no carbon chemical shifts around 76 ppm. (In peracetylated mannoside, the C5 chemical shift is 76 ppm for the /3 anomer, while it exists at 70 ppm for the a anomer.) a-Mannosyl bromide tetraacetate was more reactive than a-lactosyl bromide heptaacetate, as denoted by the excess of by-products and the diminished yield.